The voices and the footfalls of the busybodies and happy-go-lucky. The voices of the young, the prime, and the elderly ringing through the streets as they chatted away to one another or on their cell phones. The rumbling of the engines of vehicles small and large as they drove along smooth, tarmac roads, coupled with their insistent horn blaring out high-pitched shrieks. These were only a few of the things that the everyday person had to deal with on an almost daily basis. Thankfully, Sansho had grown accustomed to such things. It didn't mean he liked it, however. The noon sun drifted overhead, bathing the cityscape in a blanket of tranquil light. The gentle breeze rolled on through the concrete jungle, brushing past the folds of pedestrian clothing and signs that hung by rope, chains or leather straps. It was any wonder how good a day could have come around considering the time of year. Perhaps it had something to do with this "climate change" the demon had been hearing about. Rugged, bare feet thumped against the concrete sidewalk from the warrior who was almost as wide as the path. Others didn't dare to question his presence; the only thing they could do was to avoid him. Some even stood off into traffic just to get around him. The looks that they gave him were a mixed bag, but nothing pleasant—some gawked at his mere size; some twisted into scowls to know that such a ruffian would grace the same city they shared; others were wide-eyed and took whatever measure they could to move away from him as quickly and as distant as they could. Sansho hadn't a care. He was used to it by now. He continued walking, almost aimlessly with no destination. In truth, he was looking for something. In this city, he felt a presence that was all too familiar. It made his blood rush, and his muscles tense. The more he walked, the closer he became. The closer he was, the more he could feel it. The more he could feel it, the more his gritted his teeth behind dry, cracked lips. There was definitely another demon in this city. Ever since the debacle in the desert with him and Denim, Alaistair had become easily agitated by simple conversations over at the Cherry Valley Loft! For instance, he'd gotten into an argument with someone arguing about some trivial manner, he couldn't remember, but it resulted in that person and their friend being hoisted out the front door, with their belongings from their room being tossed right after. It'd been affecting business and everyone's time. In order to alleviate this, Alaistair was recommended that he should go to the carnival at one of the ports of the Southern Capital and have some fun. Arthus would've joined, but he'd been going out too much and needed to be working the rest of the month. Al dressed casually for this: A blank, grey t-shirt; black jeans with a thick wad of cash in his left pocket, grey sneakers with a zipper instead of laces going up the center, and his black scouter, to keep in contact with the Loft's minor workers. Granted, they could ask any of the 3 that were in charge of basically everything, but it was an emergency line for in case. Even then, they could contact him telepathically! Alaistair had been perusing the area, having gone on some rides and participating in a laser tag-like game, which used bows and digitally made arrows that had to hit these suits players were given... This he'd played a few times, winning quite easily because he was able to dodge the digital arrows, even those from behind simply because he could sense the other players around him! This didn't satisfy him, though. Not by a long shot! Instead, it served to give him more reason to go find someone and smack them around a bit. The problem was, him trying to smack someone might kill them in his state of mind and he couldn't have that! None at the carnival were strong enough to handle a few blows, so he'd given his prizes away and made his way out. He had a much better shot searching the city for a sap who would be able to handle his power! His scouter didn't pick up a presence like that, but there was a notable pressure that caught his attention quick. There was one presence, one that reeked of viciousness, skulking around the streets in search of something. It was strong, like that demon accountant of the Mazoku named Dantallion, who Alaistair sympathized and respected. Perhaps they would be worth Alaistair's time! The devil flew forward, off the ground and in the middle of traffic to meet this person. They weren't far away, and Alaistair was simply eager to meet them..! "Where exactly are y- There you are," Alaistair muttered, cutting himself off with a shout, spotting the individual over at the side! He looked like a human, but something about his energy had a wildness about it Alaistair recognized as something Demonic. Alaistair stopped on the corner of the street, in front of the man while remaining only inches above the ground. 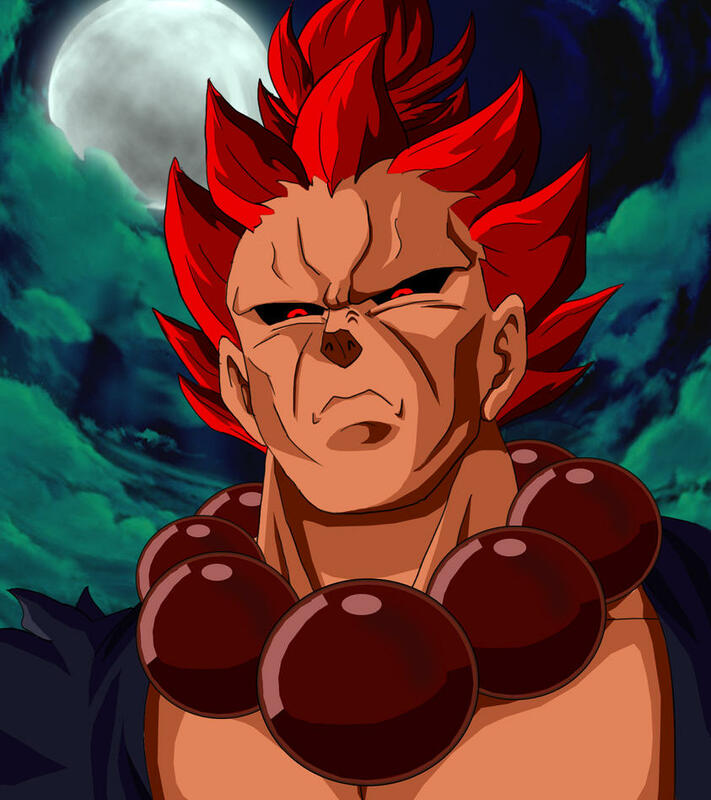 He smiled, stating, "You look a bit out of place here... Are you seeking the Tenkaichi grounds by chance?" The demon stopped. A sharp call from an unknown voice drew his attention. His dark eyes shifted to the side, catching a glimpse of one lone figure that stood out from the rest of the crowd. The figure had a lithe, masculine look that stood tall among others, though his height was shorter than that of Sansho. Demonic red eyes peered from an otherwise handsome face, though his horns, which curled backwards from his forehead, made him all the more bestial-looking. A pale, orange-pink tail lashed from behind like a reptile. 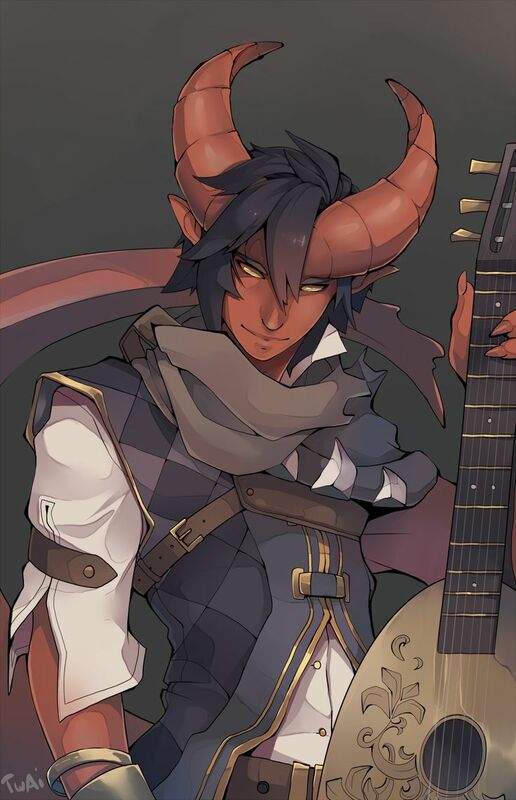 And yet for all of his demonic look, Alaistair was dressed in casual, human attire. Whether or not this was simply his dress sense or a way to blend in to mortal society remained questionable. There was no mistaking it. This was who the warrior was looking for. Sansho's full body turned to face this person, muscles tensed and faced twisted into a snarl. A furrowed brow and scrunched nose traced creases along the contours of his face. "So, it's you," he snarled in a gravelled voice, and his tone laced with venom and spite. "What are your intentions, demon? Do you seek to threaten the earthlings here?" The warrior had no love for his kin; he saw them as mindless beings with no purpose but to die by his hand. But this one, he was different. He spoke in a gentle tongue, and wore the mask of something with humanity. But whether this was sincere or just a ploy to distract others while hiding his true intentions, that remained unknown. This human-like demon turned towards Alaistair, and in a gravelly tone, identified him first before asking what Alaistair's intentions were! Alaistair heard that first sentence, but didn't really have much thought on that. He'd reply, "Not at all. I run a very reputable business in these parts that people know about. Lots of money goes in and out of it, but that's not why I'm here in front of you at all..."
Alaistair floated over to this new guy, landing on the ground in front of him and looked up to the taller demon. He told him, "My name's Alaistair and I've been trying to find a means of cooling down some frustration. From the looks of it, you're someone who could use the same thing! Am I wrong?" It was an interesting turn of events, Sansho would admit inwardly to himself. For all the demons that he had known, be they pure of half-breeds, they were nothing but monstrosities that held no sense of purpose besides three simple instincts: to kill, to destroy, and to survive to repeat the first two. Much of it he had seen in the demon realm, and even their foul influence and tendencies had spilled out into the living realm. But this one—this Alaistair, as they had introduced himself—was different. Not only had they given their peaceful intention, but they had allegedly made a life for themself here in this area. Considering their approach, their demeanour, and their open hospitality so far, the warrior would give this smaller demon the benefit of the doubt and took what they said at face value. Though it seemed that this person's offer was far from anything peaceful. "I am always wrathful, demon," Sansho responded as he folded his heavy arms across his widened, scarred chest. His gaze fixed upon Alaistair still, blackened eyes staring right into their own. His nose scrunched as he sneered. "You, of all beings, should know the wrath of demons…"
Crimson irises flicked from side to side as Sansho scanned around the area around the two of them. The place was crowded, paths littered with human life. It was any wonder what these people thought, seeing two demons conversing on a street corner. The demon hadn't a care for their thoughts. "I have no care for your frustration," he continued, his voice pitching in volume as he snuffed the smaller one. "If you intend to fix that… then what do you propose?" The warrior had a good idea as to how Alaistair was going to fix their "frustrations." "It's pure and simple: I had an itch for a sparring partner," Alaistair replied, looking around and stating with a wag of his index finger, "Not here, obviously. Too much attention won't allow either of us to exhume that this wrathful state we're both in... Assuming that you're not one to back down from this sorta thing?" He pointed from down up to this demonic human. Alaistair was operating purely on the want to get the anger out and since it was likely that he wasn't going to do that against any of his cohorts! If this warrior were to accept, Alaistair would guide them to a location outside the city. It didn't surprise Sansho much. He was right in his assumption that Alaistair was looking for a fight. It wasn't a proposal he would turn down though. The warrior stood with listening intent as his shorter kin continued. They had specified that this would not be the place for two demonic powers to clash lest they leave collateral destruction in their wake. "Good," responded Sansho, not wanting to have to think about others getting in the way of their "spar". "I have no intention of fighting in a crowded scene." His arms returned to his sides, though his muscles were still tensed, veins visible from under toughened, tanned skin. His fingers flexed, tightening into fists before relaxing once more. He could feel his violent urges welling deep within muscle, bone and soul. "If you have an idea of a suitable area," he continued, "then feel free to take me there. Consider your proposal accepted." Alaistair and this red headed warrior were in agreement and quickly rushed away into the sky and out of the city! They would go only about 10 miles away from the city, Alaistair signalling them down to an open plain with some boulders down below. The city was only a speck in the distance now, with dozens of other specks flying to and from it! It was a good location for them to use. "This'll definitely be a good spot," Alaistair announced, walking and looking around at the area, "Plenty of open area to scrap in..."
He'd stop, to look towards the arriving Sansho, cracking his fingers against the palms of his hands. Alaistair wanted this to last enough for him to express his issues! He widened his stance and brought his hands to the side. With a shout, an explosive increase of power became prominent in the Devil's form, shooting up to the same power level as this guy's in no time flat!